The MQ-1 Predator is a fully autonomous aircraft remotely supervised by three Air Force personnel - one pilot and two sensor operators. Since this drone is distantly operated from safe quarters, there is no risk of casualty, which is oftentimes a common scenario in the battlefield. This unmanned air vehicle flies up to 400 nautical miles (740 km) to a target and then returns to its base with excellent loitering endurance of 14 hours. The development of this drone aircraft began in the early 1980s as the Central Intelligence Agency (CIA) and the Pentagon experimented with reconnaissance drone aircrafts, which then became known as the "Predator". The designation of MQ-1 was appended in 2002 to indicate its new modified form for both the reconnaissance and armed reconnaissance roles. The use of drones in the battlefield helped redefine reconnaissance missions and combat. 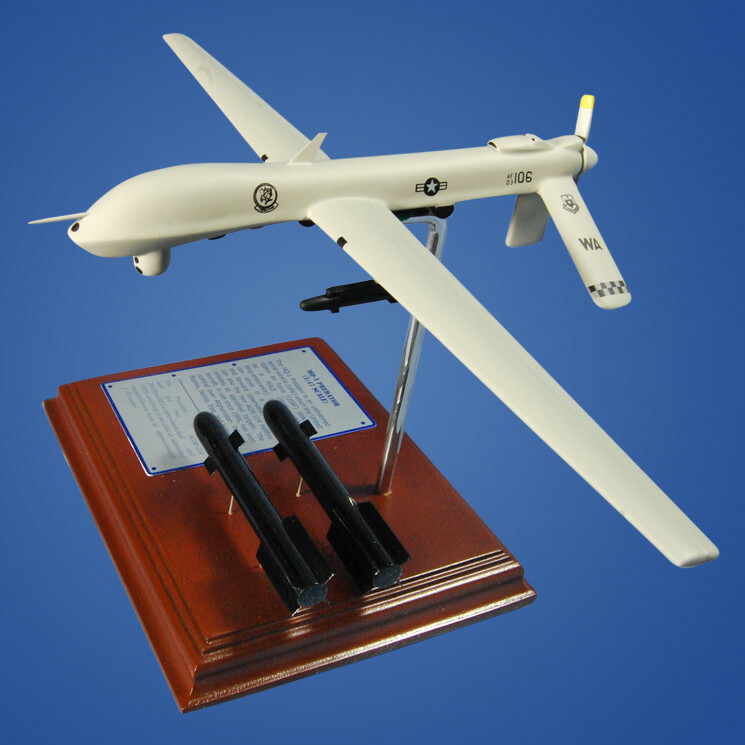 Although MQ-1s are reserved only for classified operations, you can have this MQ-1 Predator desktop model aircraft in your own home. Sculpted and meticulously painted by professional artists to match the exact design specifications of the original drone, this wooden aircraft replica would make a great addition to any part of your home.